PCH, Book Of Revelations Edition: Gray Market V12 Jag or Cheap 6.9 Benz? Welcome to Project Car Hell, where you choose your eternity by selecting the project that's the coolest... and the most hellish! It seems that the Japanese won't be celebrating an improbable victory over PCH Superpower Britain this time around, with the Land Rover beating the Nissan Patrol 57% to 43% in our poll. Today we're going to return to a couple of perennial PCH heavy hitters, cars that we all really really want, yet make us stagger back in awe and horror when contemplating the magnitude of the task they represent: the Mercedes-Benz 6.9 and the Jaguar V12! 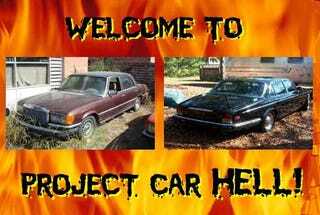 There are ordinary Project Car Hell vehicles, and then there are the heavyweights. The projects that, in the words of the prophet John in Revelations 20:10, will have you "thrown into the lake of burning sulfur, where the beast and the false prophet had been thrown. They will be tormented day and night for ever and ever." In fact, the Book Of Revelations is the only shop manual you'll need with a PCH Heavyweight, and quite a bit of it is devoted to the V12-equipped Malaise Era Jaguar. In '82, you could buy a new XJ-S in the USA for $32,100 (about 72 grand today), but some pollutin' folks decided they wanted the 299-horsepower UK-market engine instead of the emissions-friendly 262-horse unit and imported their own. And, of course, those buyers headed right to the DMV, where Franz Kafka himself was waiting for them behind the counter. Fast-forward 25 years, and we find this '82 (go here if the ad disappears), which has a steering wheel on the left side and a price tag of just $695. Whoa, that's just over $50 per cylinder! Only 37,000 miles on the clock, never titled in the USA… is that the deal of the century or what? In a sentence that pretty much sums up Malaise Jag ownership, the seller states that he or she "Had running once but not run in the past few years." Perhaps the Prince Of Darkness fuel injection (PODFI) system is a contributing factor to the non-runningness, but you'll sort that out. Thanks to Delsysdsoftware for the tip! We never get tired of V12s here, and we also never get tired of the Mercedes-Benz 450SEL 6.9. It's got a big hairy V8, it's got a Citroënesque hydropneumatic suspension, and it's got Top Mob Boss Grade luxury. In 1977, you'd have spent $39,377 for one. In 2008 dollars, that's about $141,000… but some folks don't understand the real value of these machines, which is why depreciation has gnawed away an astonishing 99.7% of the inflation-adjusted value of this 1977 Mercedes-Benz 450SEL 6.9 (go here if the ad disappears). That's got to be some sort of record, and you can be the beneficiary of this madness. Fainthearted types might think the seller's statement "this was a parts car i didnt use very many parts off of" is on the disquieting side, but the engine is (allegedly) good! We'll admit the transmission is bad, but the junkyards are full of V8 Benzes, and maybe the transmission out of a non-6.9 will bolt right up and not explode immediately. As for the suspension, how hard could it be? Hey, you can probably get this car for less than 400 bucks; in fact, "whatever you have to get it out of my yard" will take it away. Which European luxury machine will start the End Of Days... for you?